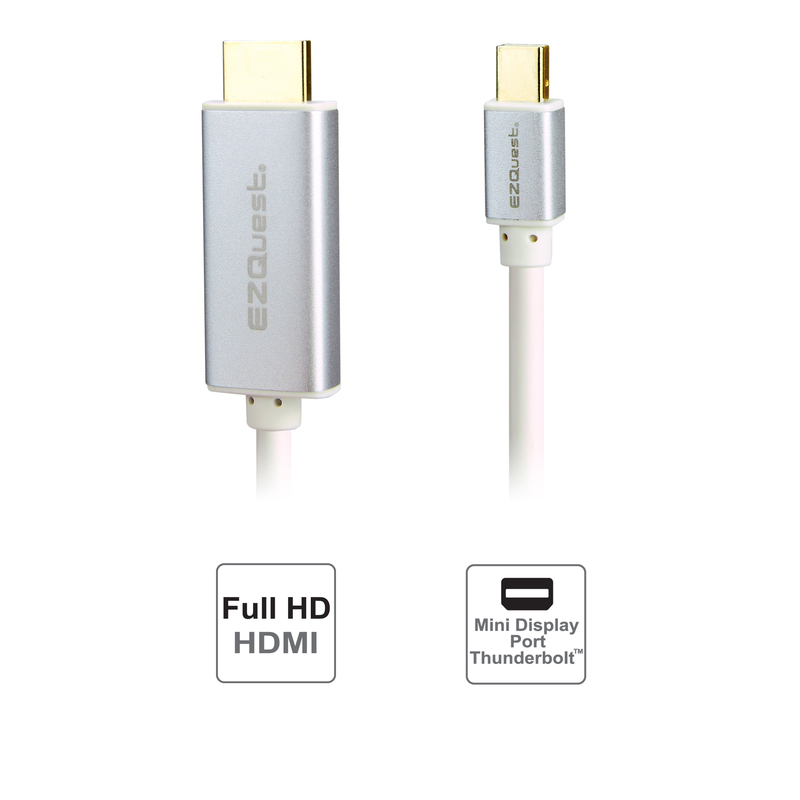 Mini DisplayPort to HDMI 6-foot Cable can seamlessly connect Mini DisplayPort or Thunderbolt™based Macs to any HDMI display. Our Mini Display Port to HDMI cable supports full HD output in 1080p with audio on most of today's MacBooks, MacBook Pro, MacBook Air, iMac, Mac mini or Mac Pro computers. You can easily watch or stream a movie or your personal video from your Mac to your HDTV. Mini DisplayPort to HDMI cable will let you extend or mirror your Mac’s desktop to any HDMI display. Don’t feel left behind because your Mac doesn’t come equipped with HDMI. Our Adapter will solve your HDMI connectivity needs. This sleek cable design does come with anodized aluminum casing on both ends to minimize EM interference. This cable combines the video and audio pass-through into one simple solution. The audio and video are drawn from the Mini DisplayPort, which eliminates cable clutter. Mini DisplayPort to HDMI Adapter can seamlessly connect a Mini DisplayPort or Thunderbolt™based Macs to any HDMI display. Our Mini DisplayPort to HDMI Adapter supports full HD output in 1080p with audio on most of today's MacBooks, MacBook Pro, MacBook Air, iMac, Mac mini or Mac Pro computers. You can easily watch or stream a movie or your personal video from your Mac to your HDTV. Fully Compatible with Thunderbolt™ Port Regardless if you have an existing Mac with Mini DisplayPort or if you have the latest MacBook Pro, we have you covered. The Thunderbolt™ Port is fully compatible with our cable. Extend/Mirror Your Desktop Mini DisplayPort to HDMI Adapter will let you extend or mirror your Mac’s desktop on any HDMI display. Don’t feel left behind because your Mac doesn’t come equipped with HDMI. Our adapter will solve your HDMI connectivity needs. All in one solution This sleek cable design does come with anodized aluminum casing on both ends to minimize the EM interference. This cable combines the video and audio pass-through into one simple solution. The audio and video are drawn from the Mini DisplayPort, which eliminates cable clutter. Now Available! Late 2016 MacBook Pro with Touch Bar (and without) Keyboard Covers We've all been there...accidentally spilling your coffee across your keyboard, snacking on food that falls all over your keyboard, or any other unexpected accident that makes you gasp, as you watch the spill disappear into your Apple investment. 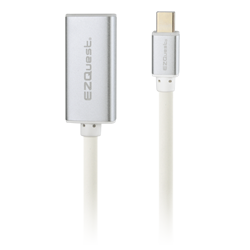 EZQuest designed the finest, most durable, yet ultra-thin, keyboard cover to protect and enhance your Apple keyboard. Most Durable, Yet Thin, Mac Keyboard Cover The EZQuest Invisible Keyboard Cover is made with the best engineering-grade thermoplastic urethane material to protect and enhance your Apple computer keyboard. A mere .1mm thin, we engineered our cover so it fits perfectly the first time you lay it down, and every time after, so it won’t slip or slide without requiring any adhesive. Put through extensive testing by a certified testing company, our keyboard covers were certified to have no detectable Latex material, which is excellent for people with Latex allergies. Our Invisible keyboard cover is molded so that it fits both US and European (ISO) Apple keyboards. The slim design is durable enough to protect your computer while providing superior typing and noise reduction. It is so clear and transparent that it is almost invisible when placed, allowing backlit keys to glow. The Invisible Keyboard Cover safeguards your keyboard from dirt, spills, and wear and tear. The cover is easily hand-washed, without getting damaged or losing its shape. 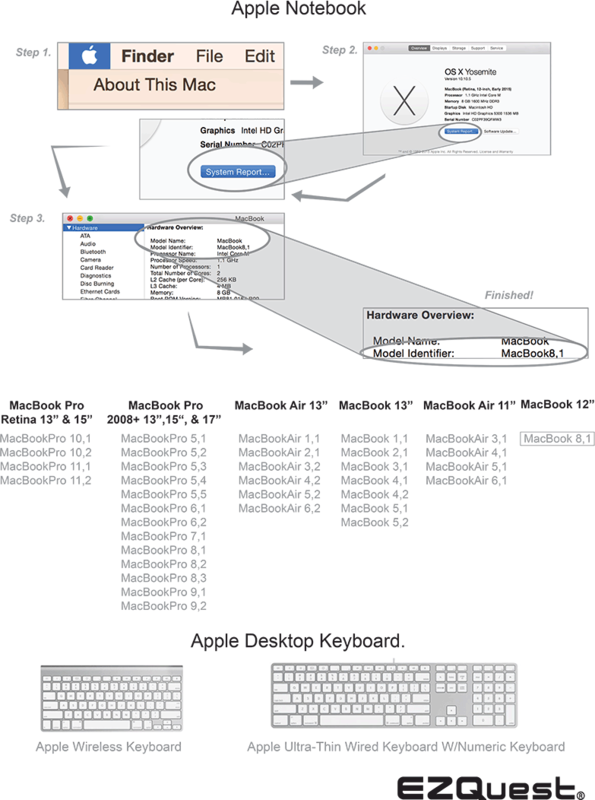 The EZQuest Invisible Keyboard Cover is the best investment you can make for your Mac.